Nick Offerman cozies up to wife Megan Mullally on the red carpet as they step out for the premiere of his new movie Hearts Beat Loud on Wednesday night (June 6) at Pioneer Works in New York City. The 47-year-old actor was also joined at the event by his co-star Toni Collette – who looked pretty in a yellow, floral-print dress. Hearts Beat Loud is a coming of age story following Kiersey Clemons‘ character heading off to college while her dad prepares to support her leaving. The movie hits theaters on June 8. 'Fun Mom Dinner' Cast Enjoys a Fun Night Out Together! 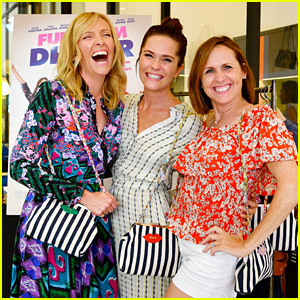 Toni Collette, Katie Aselton, and Molly Shannon pose for a cute photo together while attending an event to celebrate their movie Fun Mom Dinner on Wednesday (July 19) in West Hollywood, Calif. The event was held at the Clare V store and hosted by the brand’s designer Clare Vivier and Fun Mom Dinner producer Naomi Scott. Joining the ladies were Constance Zimmer, Abbi Jacobson, Kathryn Hahn, and the movie’s director Alethea Jones and writer Julie Rudd. Fun Mom Dinner will hit select theaters and VOD on August 4.